The chart shows the MAPS assessment. Also check out our handy (and slightly technical) guide to calculating MAPS quantitive indicators using OCDS data with data from Ukraine and Paraguay. No two countries are exactly alike when it comes to public contracting. We support countries all around the world with open contracting reforms. While we see many similar challenges, each jurisdiction is unique in its exact composition of laws, regulations, institutions, and practices. The Methodology for Assessing Procurement Systems (MAPS) provides a diagnostic tool to review public procurement systems to identify opportunities for reform and improvement. The MAPS stakeholder group, coordinated by the OECD, has recently revised MAPS and relaunched it as a tool that can be applied to developed and developing economies alike. MAPS assessments are currently being carried out in places as different as Norway, Senegal, Chile, and Antigua and Barbuda. 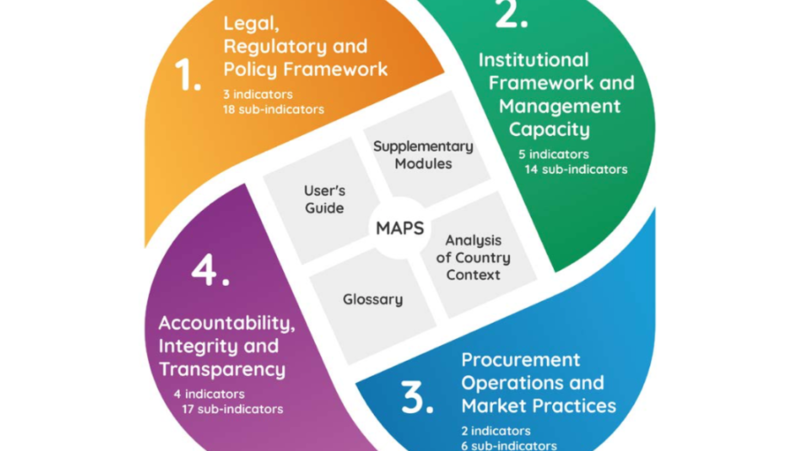 MAPS assesses procurement systems according to four pillars: legislation and regulation; institutions and management capacity; procurement operations and market practices; and accountability, integrity and transparency. At the Open Contracting Partnership, we believe that more transparency will transform public procurement so that it delivers better value for money, is more efficient, and fairer by stimulating more competition. That’s why it is so important that several of the 14 MAPS indicators are complementary to the open contracting global principles and in line with the open contracting scoping methodology. MAPS can help us determine how well a procurement system aligns with the principles of open contracting, spot opportunities to introduce open contracting reforms, and track whether they have a positive impact as we’d expect. regulations and procedures enable transparency, accountability and collaboration? public authorities involved in public contracting actively foster transparency, accountability and collaboration? governments proactively improve the quality and completeness of disclosed data and documents about public contracting? diverse stakeholders monitor the performance of public contracting, share the results and adapt? Information is relevant, timely and complete and helpful for interested parties to understand the procurement processes and requirements, and to monitor outcomes, results and performance. There is an integrated information system (centralized online portal) that provides up-to-date information and is easily accessible to all interested parties at no cost. In support of the concept of open contracting, more comprehensive information is published on the online portal in each phase of the procurement process, including the full set of bidding documents, evaluation reports, full contract documents including technical specification and implementation details (in accordance with legal and regulatory framework). Information is published in an open and structured machine-readable format, using identifiers and classifications (open data format). A transparent and consultative process is followed when formulating changes to the public procurement system? Programmes are in place to build the capacity of relevant stakeholders to understand, monitor and improve public procurement? There is ample evidence that the government takes into account the input, comments and feedback received from civil society? Requirements in combination with actual practices ensure that all stakeholders have adequate and timely access to information as a precondition for effective participation. contract management and completion (monitoring). There is ample evidence for direct participation of citizens in procurement processes through consultation, observation and monitoring. Finally, we have some good news for the many countries that are already publishing open contracting data: using the Open Contracting Data Standard can make it easier to calculate some of the assessment criteria. We’ve put together a handy (and granted slightly technical) post where we explain how to calculate MAPS quantitative indicators using OCDS data. We’ve used data from some of the leading countries that have adopted open contracting, Ukraine and Paraguay. Interested in doing some of this analysis yourself? Get in touch!